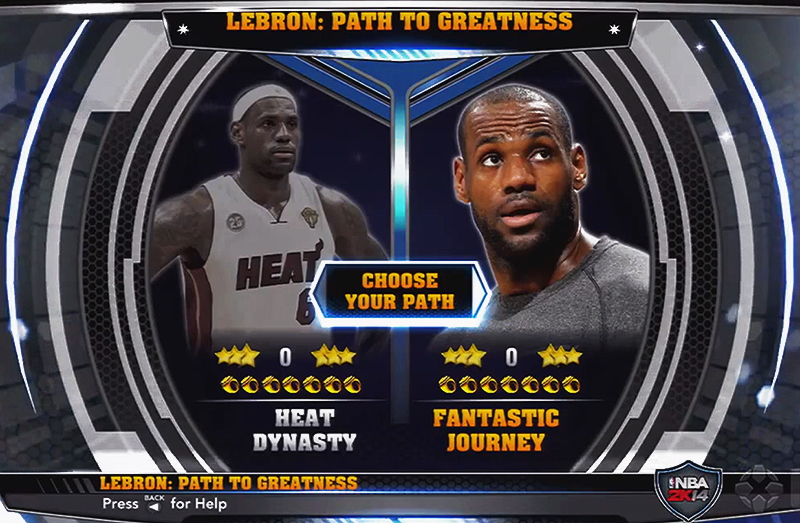 LeBron: Path to Greatness is one of the new feature in NBA 2K14. It's sort of the opposite of the "Jordan Challenge" in NBA 2K11, where you recreate Michael Jordan's most famous performances. 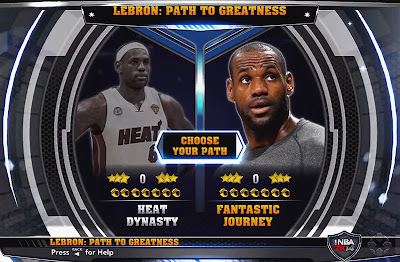 In this mode, you can select "Heat Dynasty" where you will stay with the Miami Heat for another 7 years or you can choose the "Fantastic Journey" where you try to take LeBron to the another team and see what you can come up with his career. 2K Sports added a lot of scenarios and story lines in "Fantastic Journey". NBA stars move from team to team, players get old and come out of retirement, some will make a big comeback, and many other stuff. It's basketball science fiction! The good thing is you don't have to play each full season, but rather individual games or scenarios that define LeBron's path. Today, IGN uploaded a walkthrough gameplay video on their YouTube Channel. If you haven't seen it yet, check it out below. According to some sources, this single-player mode won't be available on PC, Xbox One, and PS4. It's exclusive only to Xbox 360 and PlayStation 3 version of NBA2K14. Update: 2K Sports confirmed that LeBron Path to Greatness mode will be available on PC version of NBA 2K14.